Rafael Nadal Novak Djokovic head to head, 26th January 2019. ✨The world’s top two players will meet in their eighth slam final after Djokovic thrashed Lucas Pouille in his semi-final. Novak Djokovic and Rafael Nadal will renew their long-standing rivalry in an Australian Open final. Novak Djokovic is aiming for a record seventh men’s Melbourne title. Rafael Nadal can become the first man in the Open to win all the Grand Slams at least twice. L.P Opinion: This is the reason why we have been working 24 hours in fixing the signal connection from Prawland to the Earth, because of Prowess matches like this. We are fascinated with the creatures in this planet, some of them can reach high % in their Prowess skills, like Rafael Nadal and Novak Djokovic. Rafael Nadal vs Novak Djokovic head to head, are you ready? – What is Let’s Prowess? LET’S PROWESS COMMUNITY PRIZESLet’s Prowess L.P Community Streaming Events. The Nadal–Djokovic rivalry is a modern-day tennis rivalry. The rivalry is the most prolific of the tennis Open Era. The two have faced each other 52 times with Djokovic leading 27–25. 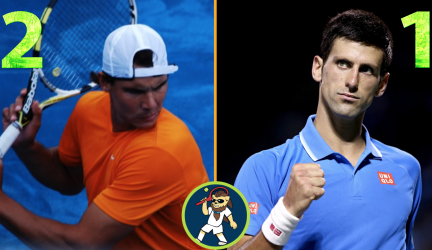 Rafael Nadal Novak Djokovic head to head, L.P Community ask: Who is better Rafael Nadal or Novak Djokovic? ANSWER: It is impossible to say who has more % Prowess Skills on tennis. Djokovic is the player with the most career wins against Nadal. Nadal is also the player with the most career wins against Djokovic. Djokovic is the only player to have defeated Nadal in 4 clay court finals, the only player to defeat Nadal at the French Open in straight sets, and the only player to defeat Nadal in 7 consecutive finals. Both play a similar style of tennis but have differences that make their matches competitive and unique. Djokovic is the only player to defeat Nadal in three consecutive grand slam finals and the only player to defeat Nadal in all four grand slams (Australian Open, French Open, Wimbledon and US Open). Conversely, Nadal is the only player to defeat Djokovic in two hard court slam finals (US Open 2010 and US Open 2013).